There is a group on SCS called the Divine Secret Sisters. The group I'm in sends a card to her Little Sis once a month. On the third month, we send a card plus a small gift and reveal who we are. I just wanted to share the two cards I received from my Big Sis. I'll post the cards I sent to my Little Sis as soon as round is over. I don't want her to accidently find her cards on my blog if she were to venture over here. I love the cards my Big Sis sent to me. I think you will enjoy them too. 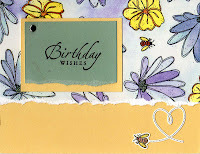 I love how the first one is multi-colored and had to use it on a card I made too. It's the tag card if you scroll down a little bit. 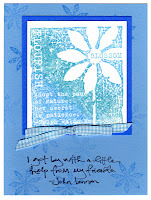 On the second one, she used the In Full Bloom Simply Scrappin' Kit. It gives me a reason to pull mine out and use it now. She also sent me a little bit of ribbon for my birthday! And being the ribbon-girl I am, I really LOVED that! I can't wait to see what my card will look like for next month!